Of course I’m (also) talking about the Cremlin complex (Кремль) and its high, bright red walls. But have you ever heard of the Seven Sisters? And not the chalk cliffs by the English Channel, that is. – Red Gates Administrative Building (Высотное здание на площади Красных Ворот). The Seven Sisters are imposing, gigantic, almost dystopian-, Big-Brother-like in size and aspect – which is no surprise, if you think about the era they belong to. If you stand in front of them, they loom over in an almost threatening way, and from a distance they end up in your field of vision when you least expect it, when you think you should not be able to see them from your standing point. Truth be told, I did end up mistaking one for another a couple of times, when glimpsing one from afar. You might not see all the Seven Sisters if you’re only in Moscow for a few days, but you will most likely bump into at least one or two of them along the way. And, chances are, you will know if’s one of them. I understand this sounds like an attempt to expand on entry no. 1. And I know that huge spaces also characterise other megalopolises, if not the majority of them. With Moscow, though, let’s face it, it’s not like with other European capitals. 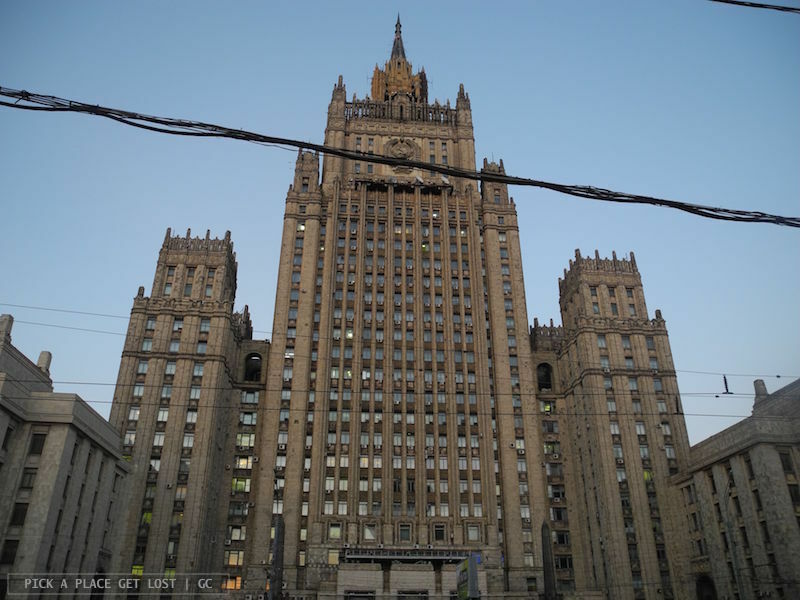 Moscow is mind-blowingly huge, and likely to belittle you, unless one’s got to know it and located familiar spots here and there around the city. 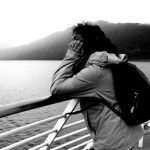 And there’s also the potential language barrier, the Cyrillic all over the place, and the fact that locals may not always come across as exceptionally friendly or amicable – with all due exceptions, of course, and in terms of first impression. Moscow is the only Russian city where I have lived (so far), which I have not just visited as a traveller. I hated and loved it so much while I was there (always thinking the feeling was mutual), yet it’s one of those places one has to see at least once, if one has the opportunity. It can’t not leave an impression. Literally. You might not witness their full potential, if you keep to the city centre during your stay in Moscow, but that doesn’t make them less noteworthy. To give you an idea, imagine you’re sitting in an electric bus (trolleybus in Russian) on your way home from university, and your bus drives down a prospekt (a very long and very broad, multi-lane street, usually located in urban areas). A junction between two prospekts is directly proportional to the size of the prospekt itself, i.e. very very broad. Your bus makes to turn left at the junction because the traffic light is green, but the light goes red while the bus is still in the middle of the junction. It stops right there, obviously, and so do the other cars in the process of turning right or left at the junction. Meanwhile, other cars are already queuing up in all the available lanes. The result is… striking. What you see from your bus is a ‘sea’ of vehicles pointing in random directions without apparent meaning or purpose. They look like a mass of cars swept away by a tidal wave. It might take a while for the traffic to resume its ‘normal’ pace – long enough for the bus driver to turn off the engine altogether and let everyone out, so they can reach their final destination on foot; it will be quicker for everyone. Based on a true story, obviously. I don’t know if and/or how things have changed over the past few years. I remember that, when I was in Moscow, it wasn’t that easy to find Russian-English, bilingual signs on the street – or elsewhere, for that matter. I had gone to Moscow to improve my Russian, in fact, so the lack of English all around technically helped. Going from the Russian spoken at university in class to the actual Russian spoken by Russian people every day everywhere, though, was quite traumatic at first, so back then some extra spark of recognition of a more familiar language would have been greatly welcome. Okay, this entry goes hand in hand with no. 2 and, yes, I know I’ve made the same remark about Kiev. Again, it’s a fairly standard statement to make, if you’re talking about a large capital city, so no wonder. 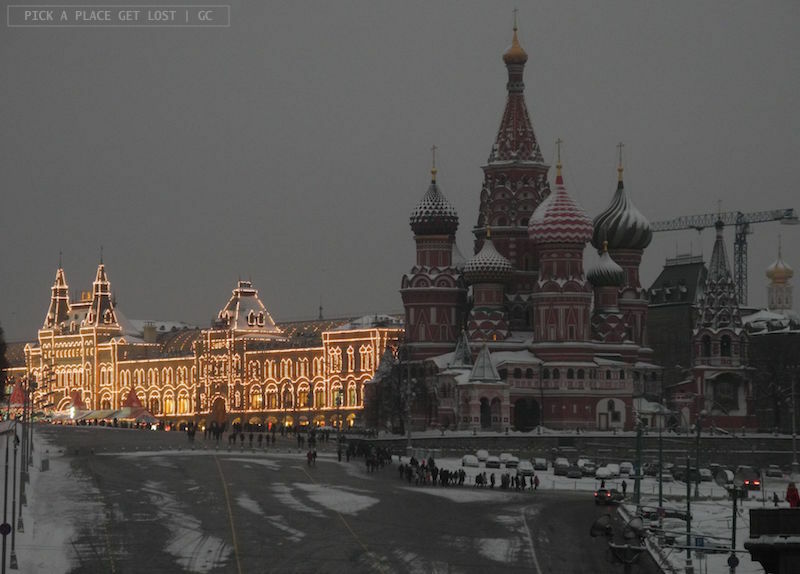 The Red Square is the Moscow everybody knows and has seen at least once on TV, in a book and/or a magazine. Ask a sample of people to name one place in Moscow they’ve heard of, and chances are most of them will pick the Red Square. Its popularity is well justified, though, since the square includes buildings and monuments of unique importance: St. Basil’s Cathedral, Lenin’s Mausoleum, the shopping centre GUM, Kazan Cathedral, the Kremlin walls, the State Historical Museum and the Tomb of the Unknown Soldier. 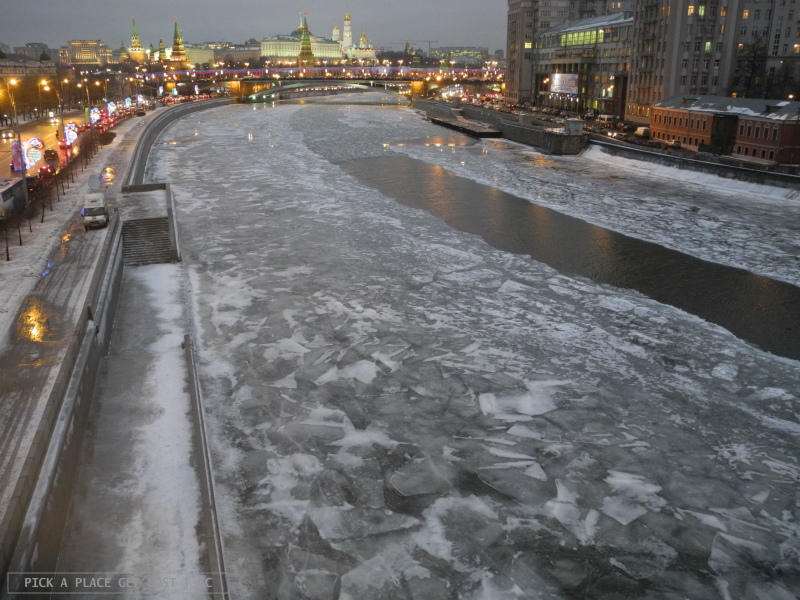 So be prepared: a visit around the Red Square might take much longer than you expect! 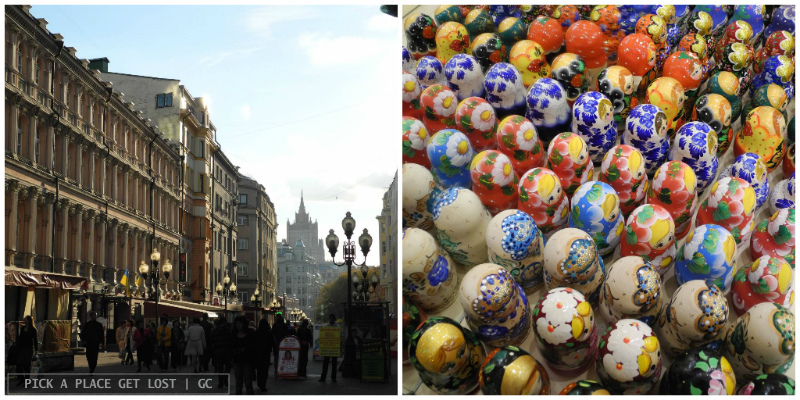 Arbat is a super popular street in the heart of Moscow’s historical centre. 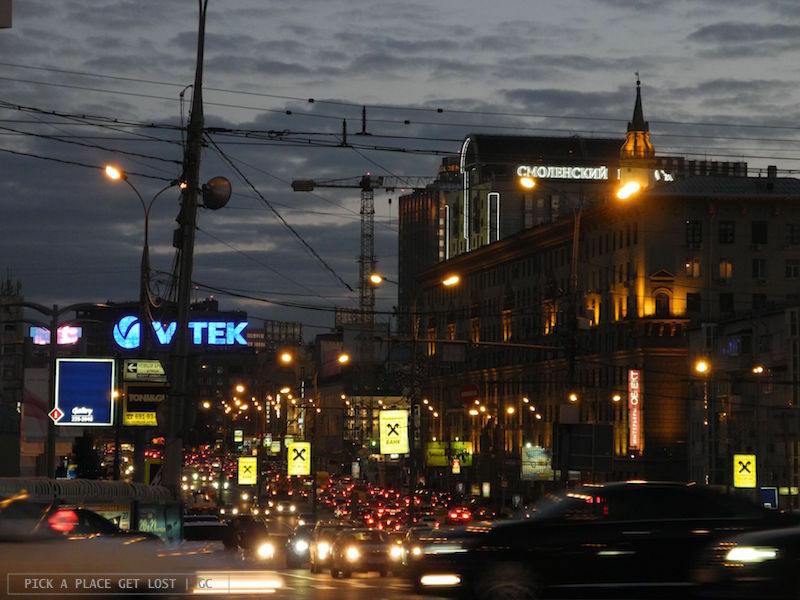 I’m not 100% sure it’s that well known to people that have never been to the Russian capital, but regardless of that, the logic is elementary: you go to Moscow, therefore you go to Arbat. The Arbat I’m talking about is the old Arbat (Старый Арбат). Yes, there’s also a new Arbat (Новый Арбат), but that’s an ordinary multi-lane, tower-block street that owes its name to the sole fact that it runs parallel to its original counterpart. Old Arbat is a one-km pedestrian street among the oldest in the city. It’s lively, dotted with colourful souvenir shops, cafes and restaurants, as well as the odd busker here and there. There is also a Pushkin Museum and, in its vicinity, the bronze statue of a gentleman seemingly deep in thought. That would be singer-songwriter and musician Bulat Okudzhava (Булат Окуджава), (also) known for his Arbat-themed songs, the most popular of which is The Arbat Song (Песенка об Арбате), a beautiful portrait of Old Arbat street. 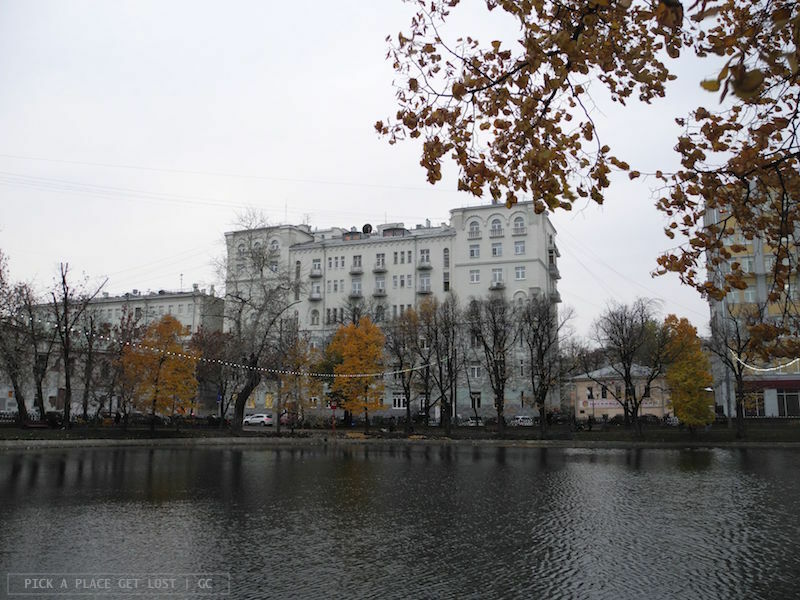 Chistye prudy literally means ‘Clean Ponds’, and is the name of a large pond situated along the Boulevard Ring in the northeast of Moscow. It is yet another top-list landmark of the Russian capital – at least, it is for me, as I loved the place while I was there. Get off at Chistye Prudy metro stop, and forget all about traffic and skyscrapers as you stroll down Chistoprudny Boulevard (Чистопрудный бульвар), along the pond. At night the area is lit up by tiny lights all year round, which makes it look even more picturesque. Fun fact: in the old days the place was known as ‘Dirty Ponds’, because people used to throw rubbish in the ponds on a regular basis. In the early 18th century the area was all cleaned up and renamed accordingly. 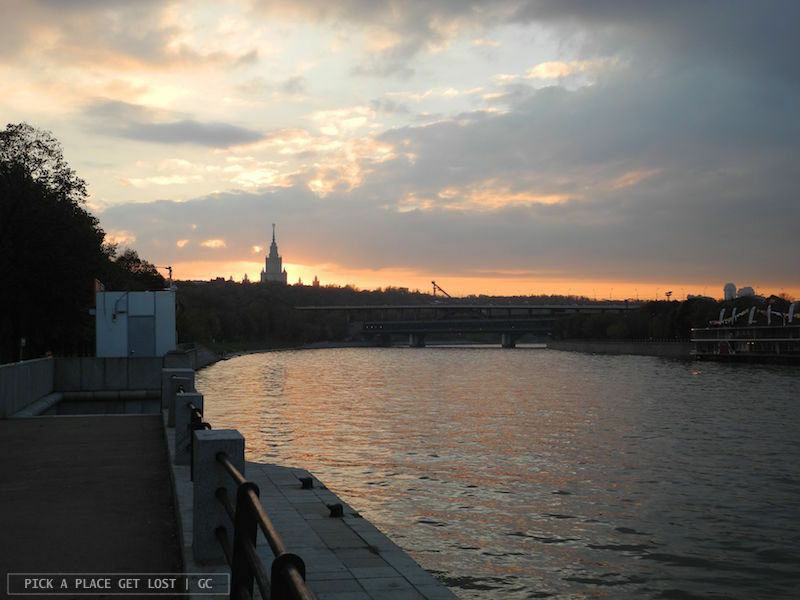 Literally named ‘Sparrow Hills’, Vorobyovy Gory is a hill on the banks of the Moskva river (Москва-река), as well as one of the highest spots in the whole of Moscow (200 mt above river level – Moscow is flat oh so flat). If you get off at Vorobyovy Gory metro station, you’ll find yourself strolling down paths lined by leafy trees, immersed in a silence and quiet that little have to do with usual Moscow. The riverbed is amazingly broad, and sunset views from there really are quite something. 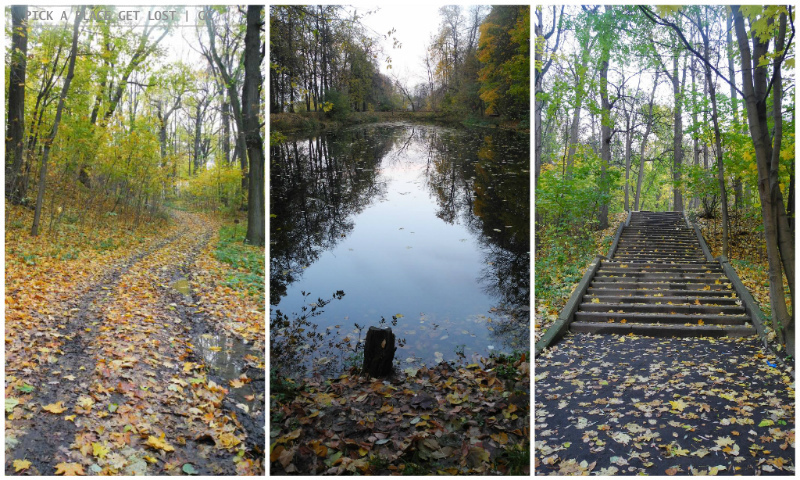 When it comes to parks in Moscow, Gorkiy park (Центральный парк имени Горького) is usually the first that springs to mind. Which makes sense: it’s the city park by definition, plus reaching its monumental entrance by crossing the bridge over the river guarantees to offer amazing views. I mentioned Vorobyovy Gory in particular for purely subjective, if not selfish reasons: it was fairly close to my Moscow dorm, and every time I went to the city centre by metro, and the metro stopped at Vorobyovy Gory, I caught a glimpse of the view, and always thought ‘I could get off here instead of going where I’m going’. 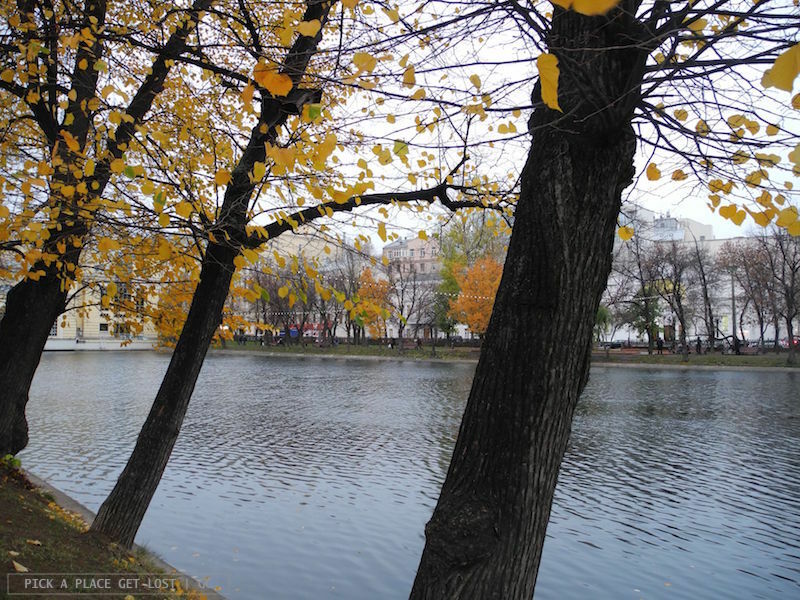 The best thing would be to visit both Vorobyovy Gory and Gorkiy park. They’re only two metro stops from each other (respectively Vorobyovy Gory and Park Kultury, both on the red line), so you’ll have to come up with a very good excuse for skipping either of them! Okay, let’s take a break from the tour (and from the list). 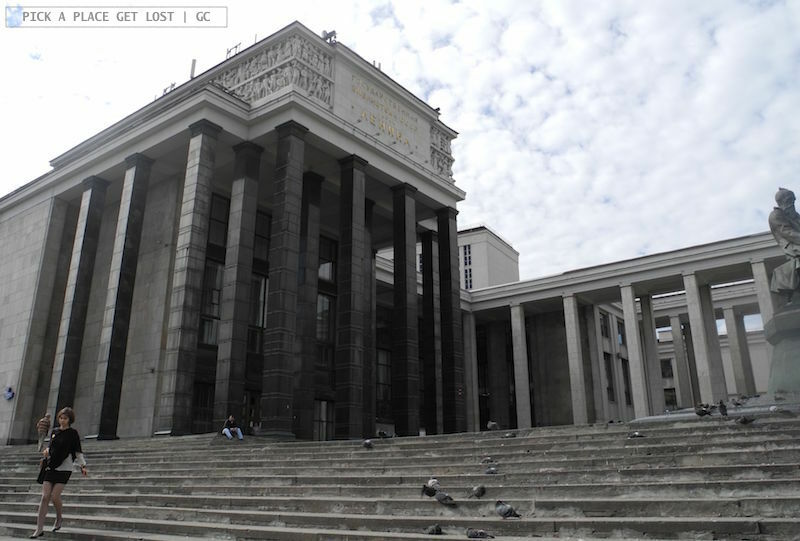 Move on to the next Moscow post for entries 6 to 10! This entry was posted in Moscow, Postcards from Russia and tagged arbat, chistye prudy, moscow, red square, seven sisters, vorobyovy gory by Giorgia. Bookmark the permalink.